Image size 7 3/16 x 4 3/8 inches (198 x 300 mm); sheet size 10 5/8 x 14 1/4 inches (270 x 362 mm). A fine, rich impression, with full margins (11/16 to 2 1/8 inches) on cream laid paper. Two small spots of toning in the bottom right margin; printing creases in the top left margin and middle right background, otherwise in excellent condition. The cowboy's work of breaking wild horses into riding horses evolved into the competitive sport of professional rodeo in the 1880's. In 1919 at the Calgary Stampede in Alberta, Canada, Borein sketched a rider on the famous bucking horse named "I-See-U". 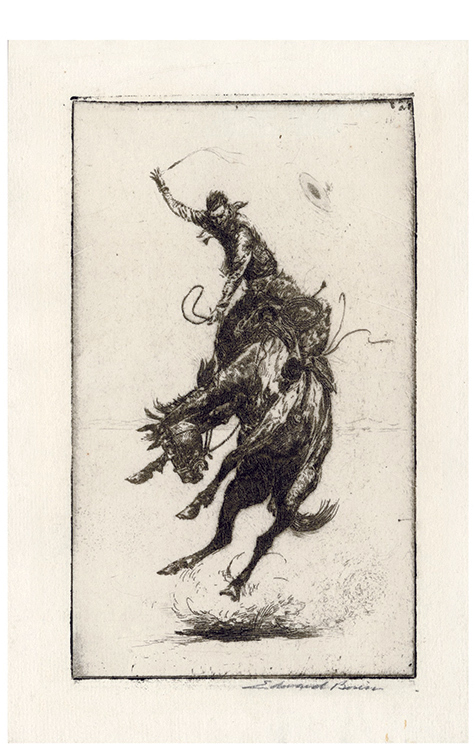 He later made this etching of the dramatic scene, entitling it Scratchin' High. 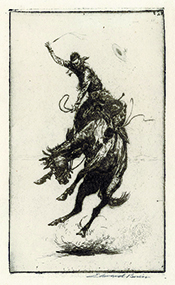 "Scratching" refers to the rider's technique of maintaining balance on a bucking horse by continuous movement of the feet in a kicking motion.